Last week I bought you news of new shop Peanut & PipÂ filled with swoon-erific goodness. I promised you a closer look at some of our favourites and with my daughter desperate to join playgroup lunch clubÂ I am starting with their splendid selection of lunch bags. First up are Skip Hop (pictured left) their funky Zoo Lunchie Bags are mini versions of their Zoo Pack Backpacks. These insulated lunch bags have a wipe clean interior and a mesh pocket inside. They measure approx:Â 19 xÂ 22.5 xÂ 8 cmÂ and is free from BPA, phthalates and PVC. The handle on top has a clip so you can attach it to a bag or pram and is the kind of innovative thinking we love from Skip Hop. There are four designs to choose from and they are a steal at Â£12.50. 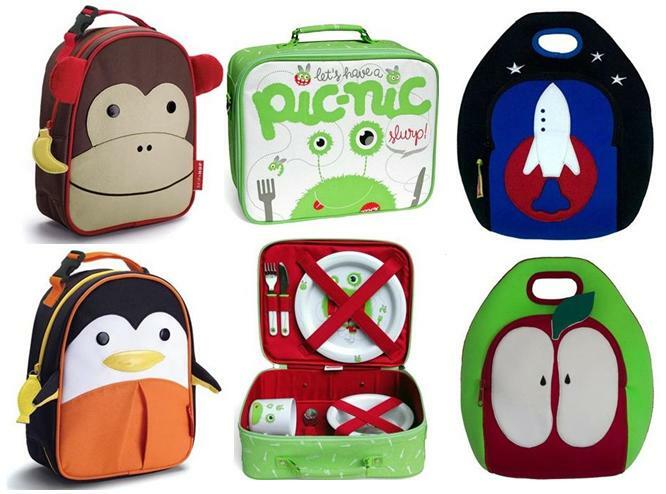 The Minimo Picnic Suitcase SetÂ (pictured centre) has everything your child could need for a civilised luncheon. The mini suitcase measures 35 x 27 x 11 cm.Â It comes with melamineÂ bowl, plate and cup as well as stainless steel knife fork and spoon. It is ideal for leisurely picnics and unconventional packed lunches such as soup. I love the hungry green character who is on the front as well as the accessories. Â£30. Dabbawalla (pictured right) is aÂ Hindi word which is the name given to the men who deliver lunch boxes to office workers. They are a US company whoÂ have taken their inspiration from European children’s design. Their bold colours and simple designs have me hooked. They are made from a remarkable material called neoprene which is free from lead and PVC as well as being highly durable and naturally insulating. Inside there are two mesh compartments which can hold drinks of ice packs for longer outings. Measures 28 x 28 x 15 cm and stands upright. Five vibrant designs all Â£22.